The mixing system. Compulsory mixer is used for mixing station mainstream home and abroad , concrete mixing plant , concrete mixing station , it can stir mobility, semi- rigid and rigid variety of dry concrete . Since the fall mixing console major stir fluidity concrete , there is little use in mixing station. Compulsory mixer includes the spindle planetary mixer , single horizontal shaft mixers and twin-shaft mixer. The integrated use of performance especially in the twin-shaft compulsory mixer is best. The aggregate supply system , aggregate supply system consists of three parts . Aggregate transport has two ways of hopper conveyor and conveyor belts. Advantages Hopper upgrade is a small footprint, simple structure. Advantages of the transport distance belt conveyor , high efficiency , low failure rate . Powder delivery : Concrete available powder is mainly cement, fly ash and slag . Currently powder is widely used way of conveying screw conveyor transport , stabilized soil mixing station, twin-shaft concrete mixer mixing floor scraper conveyor and pneumatic conveying of. The advantages of the screw conveyor is of simple structure, low cost and reliable use. Conveying fluid , mainly referring to water and liquid admixtures, they were delivered by the pump . The control system , the control system of the central nervous mixing station equipment package. measurement systems , measurement systems, the key components affecting the quality of concrete and concrete concrete mixer manufacturers, which is mainly divided into aggregate weighing , weighing powder and liquid weighing three parts. Under normal circumstances, less than 20 cubic meters per hour, weigh batching superposition way that aggregate ( sand and stone ) with a scale, a scale with cement and fly ash , water and liquid admixtures were weighed , concrete mixing , and then put into the water , said liquid additive premixed infighting . And at 50 cubic meters per hour, mixing station , the use of all known materials weighing independent way , all have adopted electronic weighing scales and computer control . 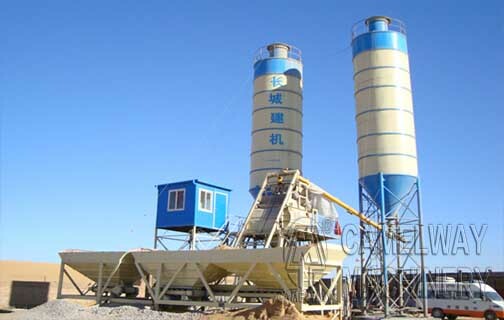 Aggregate weighing accuracy ≤ 2%, stabilized soil mixing station , weighing accuracy cement , powder , water and admixtures are up to ≤ 1%. This entry was posted in Cambodia Batching Plant, Solution and tagged Concrete Batching Plant by camelway. Bookmark the permalink. How to Debug JS Forced Concrete Mixer ?